If you’re like most people, you wish you had the ability to make a difference, but you don’t have the credentials, or a seat at the table, can’t get past the gatekeepers, and aren’t high enough in any hierarchy to get your ideas heard. 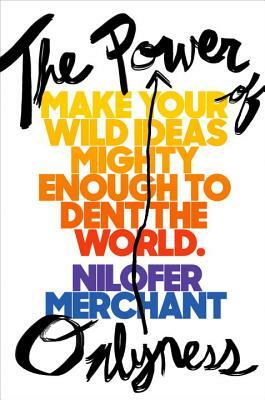 In The Power of Onlyness, Nilofer Merchant, one of the world’s top-ranked business thinkers, reveals that, in fact, we have now reached an unprecedented moment of opportunity for your ideas to “make a dent” on the world. Now that the Internet has liberated ideas to spread through networks instead of hierarchies, power is no longer determined by your status, but by “onlyness”—that spot in the world only you stand in, a function of your distinct history and experiences, visions and hopes. If you build upon your signature ingredient of purpose and connect with those who are equally passionate, you have a lever by which to move the world. This new ability is already within your grasp, but to command it, you need to know how to meaningfully mobilize others around your ideas. Through inspirational and instructive stories, Merchant reveals proven strategies to unleash the centrifugal force of a new idea, no matter how weird or wild it may seem. Imagine how much better the world could be if every idea could have its shot, not just the ones that come from expected people and places. Which long-intractable problems would we solve, what new levels of creativity would be unlocked, and who might innovate a breakthrough that could benefit ourselves, our communities, and especially our economy. This limitless potential of onlyness has already been recognized by Thinkers 50, the Oscars of management, which cited it one of the five ideas that will shape business for next twenty years. Why do some individuals make scalable impact with their ideas, regardless of their power or status? The Power of Onlyness unravels this mystery for the first time so that anyone can make a dent. Even you. Nilofer Merchant is the author of two previous books and is ranked by Thinkers50 as one of the world’s leading thinkers. She has personally launched more than 100 products, netting $18B in sales, has worked for companies ranging from Apple to Autodesk and advises many others. Her visionary ideas have been recognized by The Wall Street Journal, The New York Times, Financial Times, Fast Company, Fortune, Marie Claire, Vogue, O: The Oprah Magazine, Harvard Business Review, Bloomberg, CNN, Time, and Mashable. Her 2013 TED Talk “Sitting Is the Smoking of Our Generation,” is in the top 10 percent of TED’s most viewed talks.